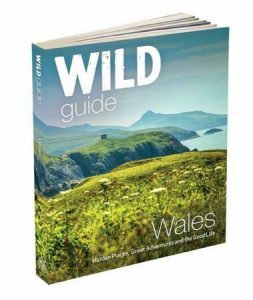 Daniel Start, author of the new Wild Guide to Wales, shares his favourite wild wonders of the Welsh coast.. 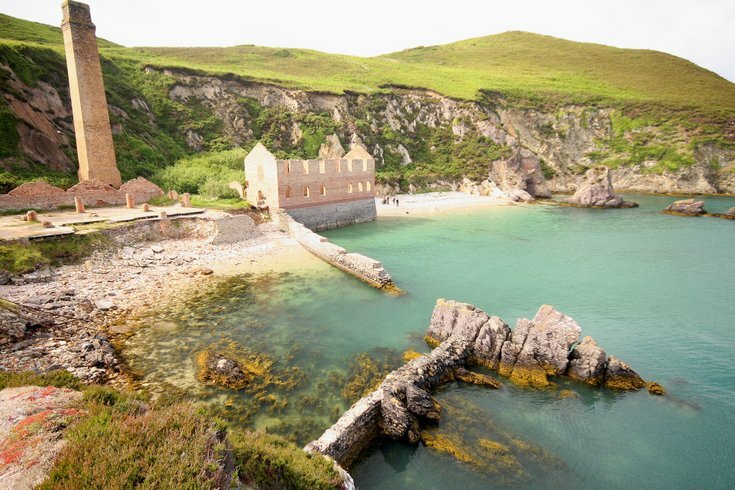 This superb hidden bay on the remote north east coast of Anglesey is dominated by an amazing ruined brickworks, with an abandoned harbour and an intriguing set of beehive kilns which you can still go inside. As if that’s not enough there’s a shiny white pebble beach and a rock arch you can swim under. From here you can walk westwards, past Hell’s Mouth cove, to explore Llanlleiana porcelain clay works, another striking ruin on its own remote beach. Tucked away down tiny lanes this this white-sand crescent-bay is dotted with tiny islets, perfect to swim, canoe or paddle board around. With the dramatic back drop of Snowdonia’s mountains it feels little like something from the Bali or Lombok. From here the coast path leads to the white and black sea arches of Bwa Gwyn and Bwa Du through which the adventurous can try swimming. St Gwenfaen’s holy well is also on route and the return brings you back via the excellent gastropub, the White Eagle. 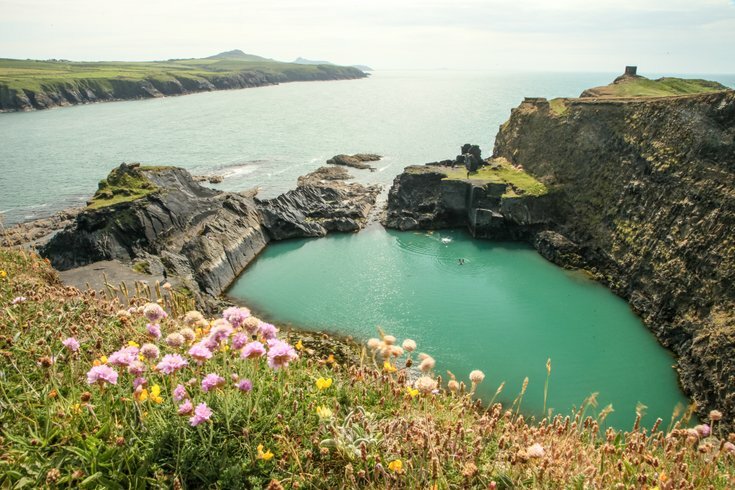 A timeless island feel pervades this magical and often overlooked peninsula – some say the Lleyn is like Cornwall 50 years ago. The beaches are mostly empty outside of the two main towns, and Hell’s Mouth is no exception. It’s over four miles of south-west facing sand and dune, perfect for driftwood fires, star-gazing and bivying. It’s also rated one of Wales’ best surf beaches, but be careful as the breaks can be strong. 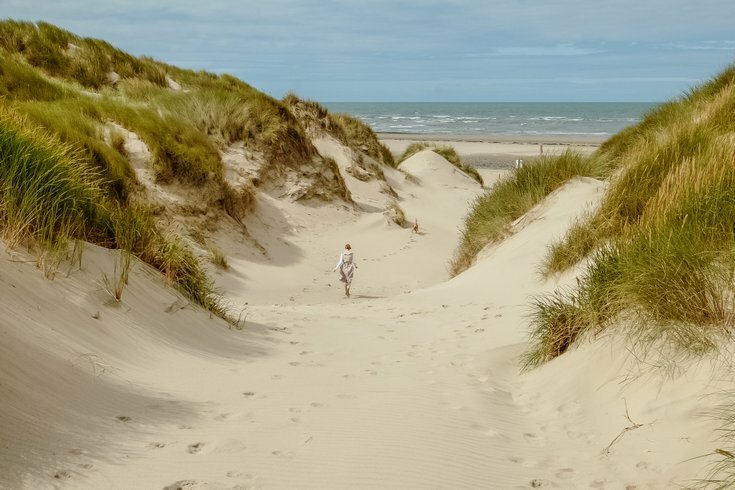 On a sandy peninsula at the mouth of the Dovey estuary, this vast beach is backed by huge dunes rich with orchids in May and June, skylarks and sand lizards in summer and fungi in autumn. 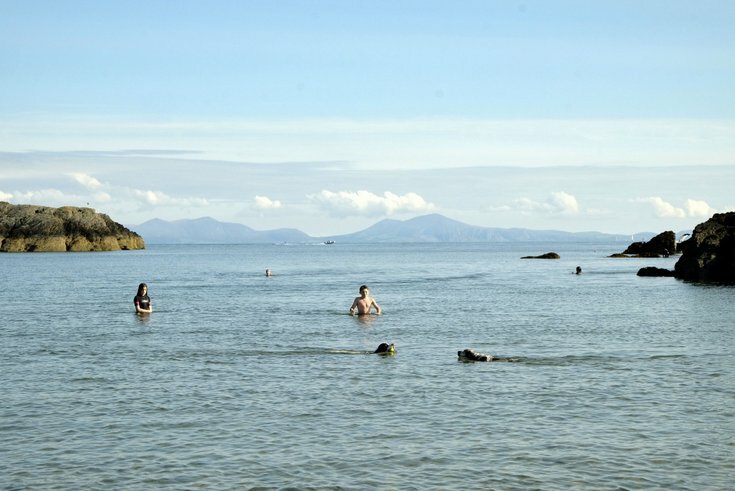 If you have a canoe explore upstream to find sand flats and pools, or paddle across to pretty Aberdovey for an ice cream. Follow B4353 from Borth or Tre’rddôl and take turn on bend, past SY24 5JZ to park on beach (keep an eye on the tide!) 52.5269, -4.0521. Around Ceibwr Bay great folds of contorted rock shelve into pellucid seas, while deep caves and sea tunnels punctuate the headlands. The Witches Cauldron is a chasm behind the cliffs which harbours an iridescent green pool and small beach. The mysterious and seemingly inaccessible lagoon can be reached by climbing down a small waterfall, but it’s also fun to swim in via one of the two sea cave tunnels that converge in a giant sea cavern before entering the pool. 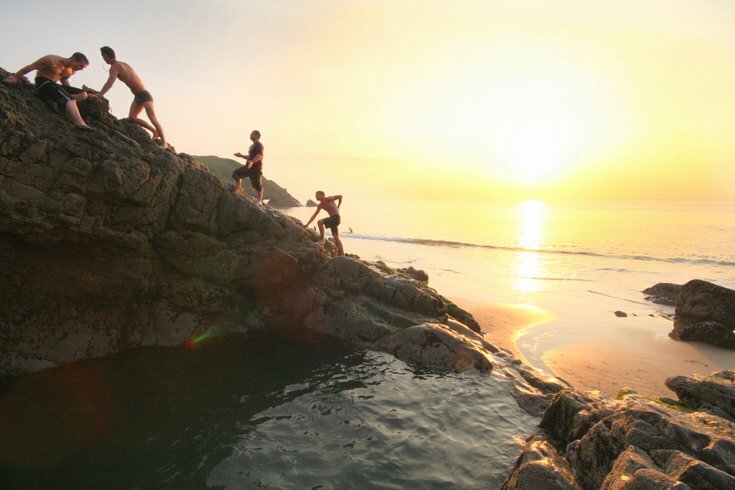 The whole coast is superb for coasteering and kayaking adventures. This iridescent pool was once a quarry but it has long since breached to the sea and the old wheelhouse now provides three platforms for leaping into the deep blue abyss below – a famous rite of passage for local swimmers and visitors alike. 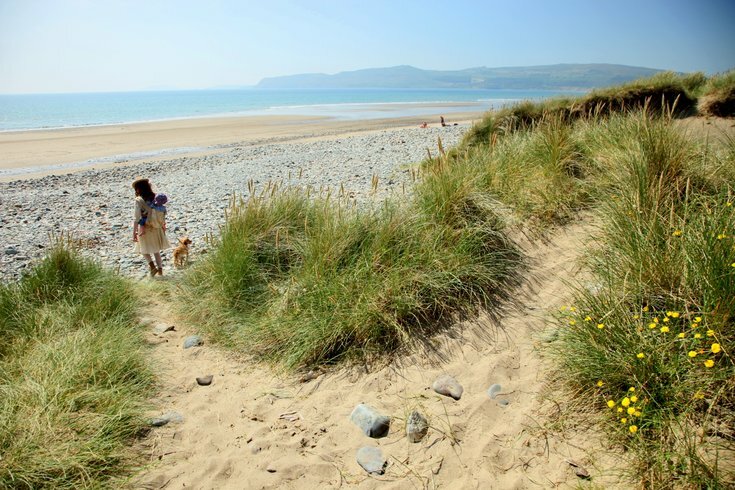 Walk east along the spongy, flowered coast path to Traeth Llyfn, a superb west-facing, sandy secret beach. Keep on going to find the old tramway leading down to the huge brick loading hoppers in Porthgain harbour, home of the famous Sloop Inn and gastro fish and chips at the Shed, a converted wharf shed on the sea front. The limestone rock stratas here have eroded here to create huge ‘church doors’, a rock arch of abbey-sized proportions and grandeur. 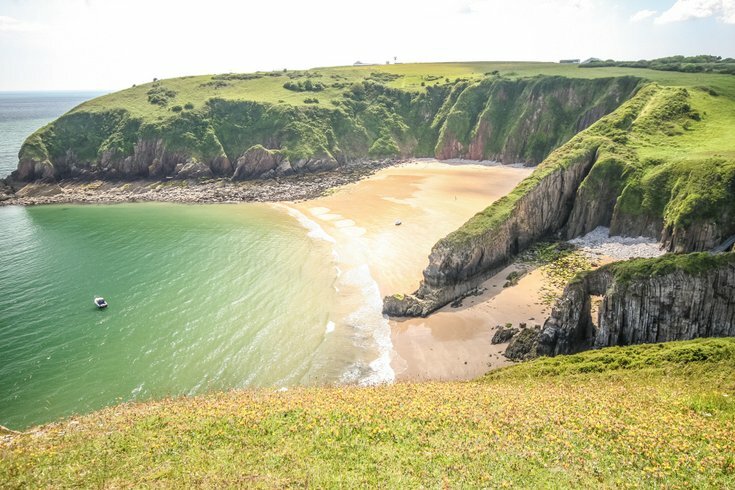 Below is a beautiful south-facing sandy cove with a secret rock tunnel which, at mid tide, leads through to the secret sands of Skrinkle Haven. There’s a mammoth sea cavern here, over 50 feet tall, and you’ll likely have the beach all to yourself. Also check out Lydstep Caverns at low tide, it’s a short walk along the coast and there are even bigger sea caves and arches. 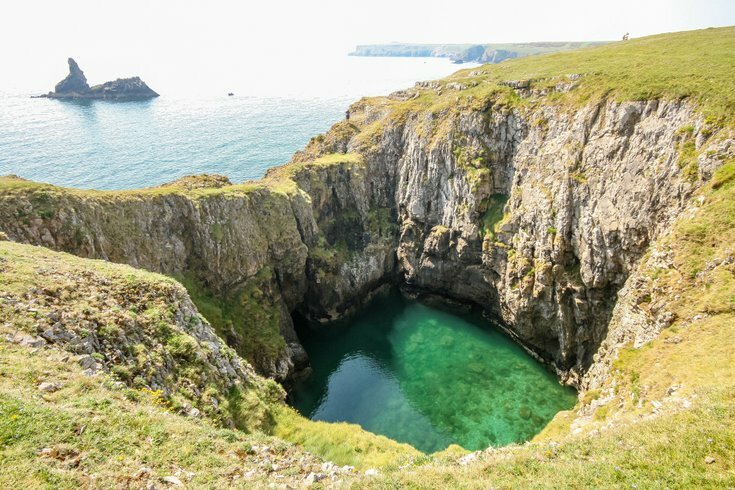 Broad Haven is one of the best beaches in Pembrokeshire, with Church Rock to swim out to, a beachside campsite and Bosherston Lilly Pods to explore. For adventurers the limestone cliffs of Saddle Point headland are riddled with blow holes. One of the most impressive is a cavern that has collapsed forming a blue crater that fills with water, accessible below mid-tide via a sea cave linking it through to the ocean. You can swim on a little further for more blowholes, including a chimney known to climbers as Confucius Hole, and eventually into Box Bay, a steep-backed Robinson Crusoe beach perfect for those who like solitude. 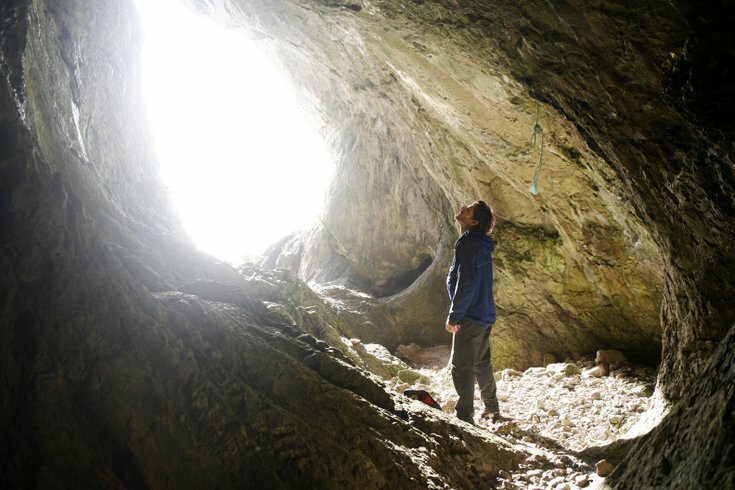 Head down a remote little valley, just above the ocean foreshore, and clamber into a large, dry cave, one of the oldest ceremonial burial sites in western Europe. In 1823 the ‘Red Lady of Paviland’ was found here, named because of the ochre-stained bones, and thought to be a women from Roman eras. We now know the bones belonged to a man who died 33,000 years ago. Interred with sea shell jewellery, his burial was ceremonial, and the site was possibly a shamanic one. Today the waves come crashing in below the entrance at high tide, marooning you here if you are not careful, but in those times, the cave looked out on a vast plain, where bison and mammoth roamed, and the Bristol Channel was just a shallow meandering river. This bay harbours one of the best rock pools in Britain, a deep natural tub into which you can leap from the rock ledges above. Fine sands stretch out to the Three Chimneys rock arches; the caves within are said to contain gold coins from a Spanish shipwreck, so set the kids off exploring. A little further on, the adventurous can scramble to the narrow slit-like entrance of Culver Hole, only accessible at low tide. It opens into a large prehistoric cave chamber in which many human remains were found. Afterwards refresh at the Kings Head, with lots of local ales on tap, including their own Gower Brewery craft ales. Daniel Start is author of Wild Guide Wales and Hidden Beaches Britain (Wild Things Publishing, £16.99).